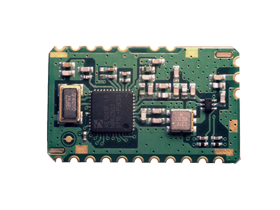 The DP1203 Series is a radio-only RF transceiver module. It is designed for the wireless transmission of digital data at data rates of up to 152.3kbps. Operating in the 433, 868 and 915MHz license-free ISM (Industrial Scientific and Medical) frequency bands it is ideal for applications that require full control of the radio channels and configuration without having to go through the effort and expense of a discrete RF design. The module is capable of generating up to +15dBm into a 50-ohm load and has a receive receiver sensitivity of -111dBm. This gives the module a typical line of sight range of 2 to 3 miles (3.2 to 4.8km) at the maximum output power with typical monopole whip antennas, depending on frequency. Regulations in the country of operation dictate the maximum legal output power, so the final system range may be less depending on the country of operation. The module is based on the XE1203F RF transceiver from Semtech and contains all components necessary for proper operation. An external microcontroller is required for configuration and as the data source, but no RF components are required other than an antenna. The radio only design with external microcontroller gives the designer flexibility in controlling the radio. This includes controlling power to maximize batttery life, optimize communication protocol, and adjusting the radio on the fly to improve the link quality through Received Signal Strength (RSSI) and Frequency Error Indicator (FEI) features.